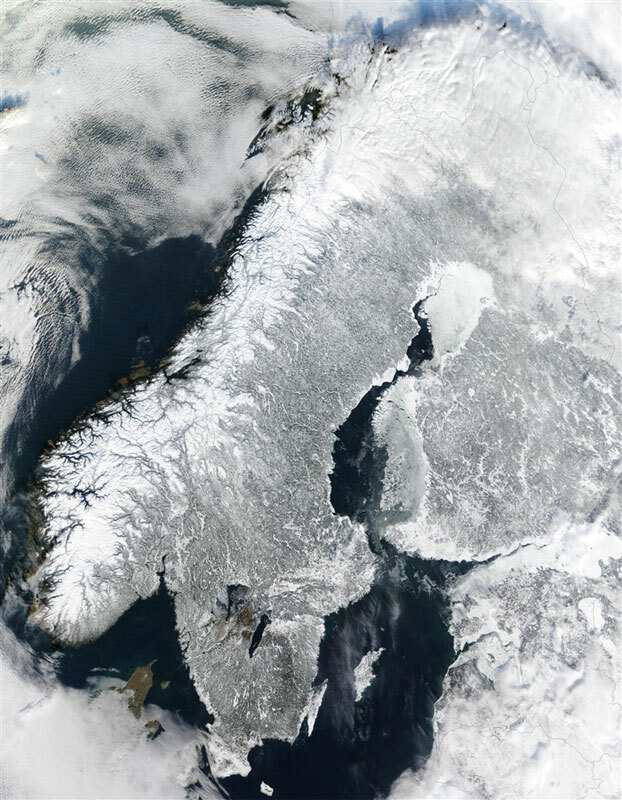 No, it’s not a glacial period – just a regular Scandinavian winter. It’s been a long cold snowy winter. It started in late September last year and it only just ended. That’s almost seven months, more than twice as long as a regular winter. And this is not the first extreme winter we’ve had in Europe lately. The winter 2010/2011 was also very cold, with plenty of snow, as was the winter in 2011/2012. There’s very little doubt that we’re indeed experiencing global warming. Temperatures have been rising drastically for the last hundred years or so. There’s also very little doubt that human-produced emissions are behind this rise. 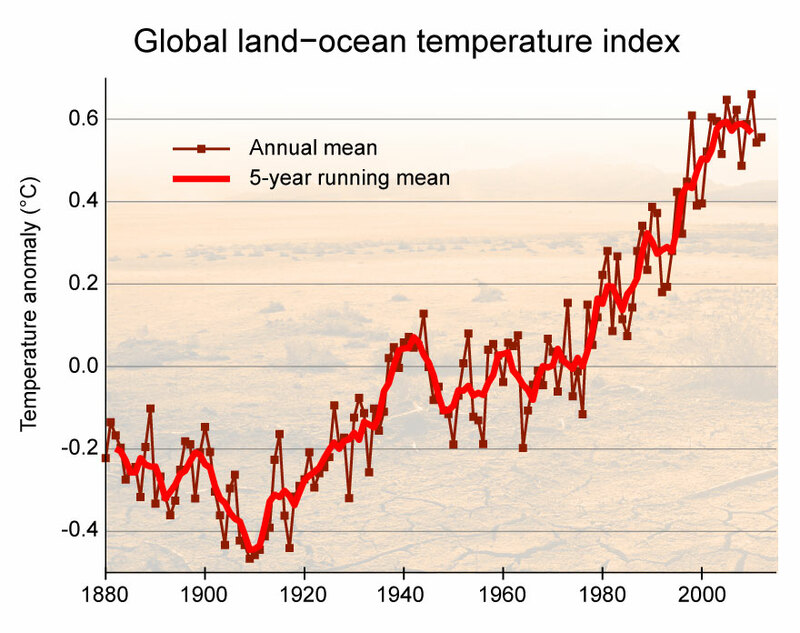 The increased temperatures have already had an effect on the weather systems on the planet. Heavy rainfalls have become more common, as have floods and tropical typhoons. And – rather counter-intuitively – the number of very cold nights have increased as well. We’ve definitely left the heating on. The reason for these meteorological anomalies aren’t completely clear, but it’s pretty certain that we’re pushing our climate out of its point of equilibrium and into a state of chaos. The expected short-term results are extreme weather, failed crops and increased deforestation. Are we going to run out of ice? It has also affected the world’s glaciers. 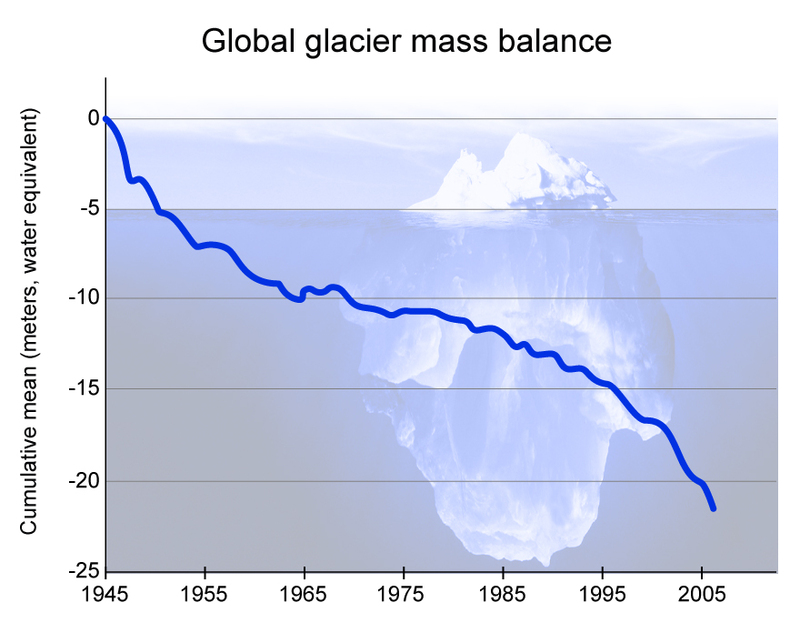 The global glacier mass balance has shown negative values for 19 consecutive years now. This means that on average, we’re losing more glacier ice each summer than what builds up during winter. We’ve already seen the effect of this on the Arctic ice sheet. The amount of summer ice is continuously diminishing and it’s impacting the Arctic wildlife in a drastic way. Polar bears are indeed struggling to find food when they can’t hunt from the ice, and the amount of sunlight hitting the naked ocean surface increases the amount of algae and might even affect the ocean currents. I know. This still doesn’t explain why the winters should suddenly have become so much harsher. If the planet is warming up, why are the winters now so cold and snowy? Well, perhaps global warming could explain the snowy part. The increased precipitation caused by global warming would also result in more snow in the winters. 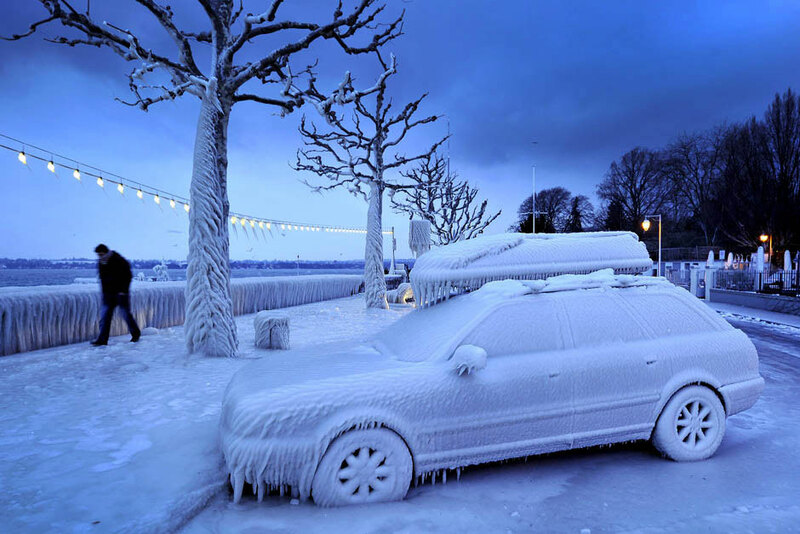 It might look utterly unreal, but it’s in fact a photo from Lake Geneva, February 2012. For the low temperatures we have to look elsewhere, and the obvious culprit is changes in wind patterns. We’ve had a lot of cold Arctic winds the last few winters, and it’s lowered the mean temperatures by several degrees. But that doesn’t really explain the phenomenon in full. The question then would be why has the wind patterns changed? Before trying to answer that question, let’s call the phenomenon by its proper name (nothing can be investigated thoroughly without having a proper name for it, surely? ); it’s known as the Arctic Dipole Anomaly. It’s a pressure pattern over the North American parts of the Arctic that’s accompanied by a low pressure zone over Europe. Since air tend to flow from high pressures to low, cold Arctic winds have replaced the otherwise milder Atlantic winds typically dominating European winters. The origin of this Arctic Dipole Anomaly is not known, however, but it’s likely that it’s also linked to global warming. The end of something, or the beginning of something else? 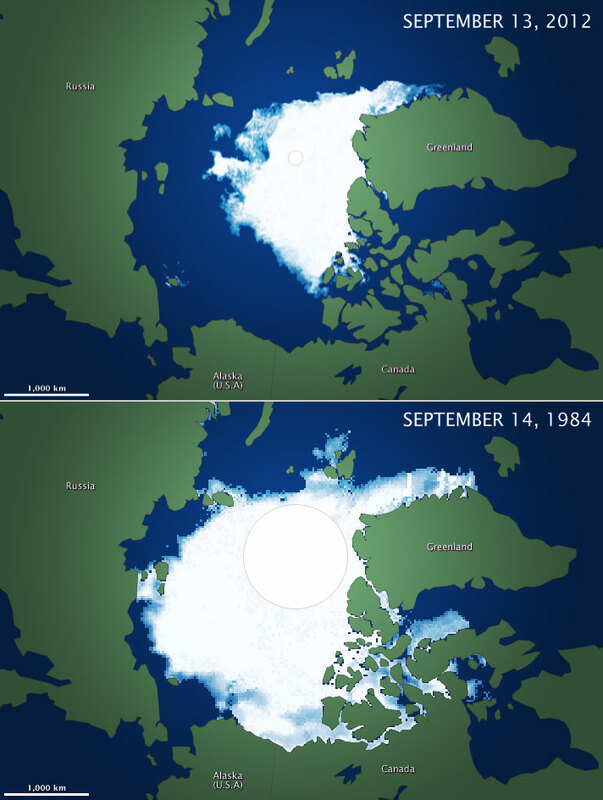 Arctic ice coverage in September 2012, compared to a typical year (1984). As I’ve mentioned before, we’re currently living in an ice age. It might not feel like we do, since we’re enjoying a temporary interglacial thaw, but we do. The presence of polar glaciers – although diminishing – is a clear indicator that so is the case. The current ice age, known as Pleistocene glaciation, is already some 2.58 million years old and shows no signs of ending anytime soon. Every 100,000 years or so, a new glacial period starts which lasts for 70-80,000 years to be followed by an interglacial period of 15-25,000 years. So what am I saying? Are we on our way into another glacial period? Is this the end of the Holocene epoch? Well, we don’t know. The glacial-interglacial cycles aren’t exactly regular and seem to be partly governed by chaotic climatological events. But there is this theory of an ice-free Arctic ocean acting as a trigger for glacial periods; that the lack of ice cover would promote moist air to move in over land and result in more snow, adding to the glacial mass balance. In Norse mythology, we have the concept of Ragnarök – the end of the world, where gods and humanity will perish and all the land will be washed away by a great sea. It begins with a series of particularly harsh winters, where the snow will stay on through the summer, crops will fail and society fall into chaos. We call this Fimbulwinter, the Great Winter. Perhaps the old Vikings knew something we’re only now starting to figure out? * I’ve yet to see any polar bears near my rubbish bin, but I’m certain it’s just a matter of time. ** I say instant, but that’s in geological measures. Even if the changes in temperature and the resulting meteorological effects could be felt within years, we would expect the forming of glaciers to take centuries or even millenia. I would like polar bears in my rubbish bin. Had I a rubbish bin. No rubbish bins for me. So from this post, I am getting that you have solved Robert Frost’s poem, and that the world will end in ice, not fire. I don’t know if I want it to end in either. I’m not good in cold OR heat. Can the world just end in balmy spring temperatures instead? That’s my preference. What? I don’t get a preference about the end of the world? Well, THAT seems very unfair. Fimbulwinter is one of my new favorite words now. A glacial period would not be the end of the world. It’s just the beginning of a new climate. New coastlines, land-bridges and giant freshwater lakes. And it will quite probably stop the global warming short in its tracks, which I somehow doubt we will be able to do on our own. So it’s really rather positive news, this whole Fibulwinter malarkey. I totally misunderstood. That’s not overly surprising. So we wouldn’t all DIE if this happened? I guess I just assumed we would all freeze to death. Huh. It’s only not overly surprising because Ragnarök does indeed mean the end of the world. 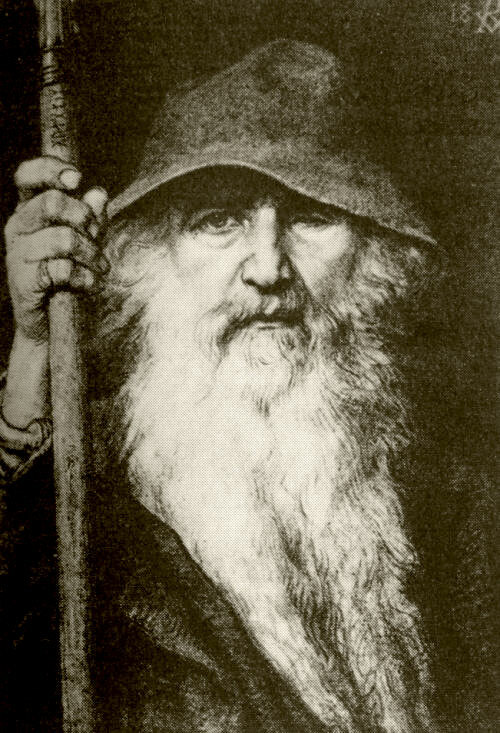 But even in the old Norse stories a few people survive and repopulate the earth. As to a new glacial period, we’ve had those before, even during our own species lifespan. It would mainly mean loss of habitat in the far north and the gaining of new habitats further south. The Saharan desert would bloom again and all the continents would become connected by land-bridges. *ponders* Ok, that would probably add to the current mass extinction rate, but you can’t have everything I guess. New species will form eventually. In a few million years or so. Amy, if you want to see polar bears up close & after rubbish bins, you could visit Churchill! I have cousins who lived there, and when the bears got hungry they would sometimes come into town. Nah. I think they’re more something I like to imagine in the abstract than be eaten by in reality. I think that should be a new proverb. Can the world just end in balmy spring temperatures instead? Oh, I’d like that, too! I’d like the last day of existence to be warm, with a hint of breeze, not humid — shorts & t-shirt weather. Who do I talk to about this? I think Andreas. I feel like he’s the man to talk to about all of this. He knows more about it than anyone else I’ve ever spoken to about it. Awesome! So, Andreas, buddy, pal, friend…mind tinkering with the climate calendar to make sure The Final Day coincides with pleasantly warm weather? I think that’d be a nice way to go. I’d love to, but since that little mishap last time I tried (I don’t want to talk about it), I’m no longer allowed to tinker with the climate. Not even a little. I find this fascinating, and also heartening. I think a global rise in temperature would be more disastrous than a plunge into a new (or merely the next) glacial period. After all, humans have a track record with surviving ice ages. Maybe we could successfully clone mammoths and restore some megafauna while we are at it. I agree that a new glacial period is preferable to the effects of run-out-of-control global warming. But for the extinct mega-fauna: there’s more to cloning than having access to complete DNA (which in itself is very rare). We also need access to cells nuclei with the DNA organised in the correct chromosomes, or no viable organism is possible. In addition, with a population of 7,000,000,000+ people, we don’t even have room for the existing mega-fauna, let alone any cloned additions. I suspect we will have to learn to accept that extinct species will stay extinct. And that endangered species probably already are doomed to extinction as well. Oh, did I forget to say ‘Spoiler alert’? Spoiler alert. Oh well. Probably for the best. This whole conversation makes me giggle. BEST SCIENCE FELLOW EVER. Hollywood should consult with you, Andreas, seriously. Well, I think they should. I’d have plenty to say. But they seem to disagree. Let’s see…it was documented in four different films, so if we subscribe to the GWS (Great White Shark) reincarnation theory, it came back three times before being definitively destroyed in the Caribbean (as far as we know…). Otherwise, as I said, there could be some genetic taste-for-human-flesh (hereafter “TFHF”) that got passed from the first shark to its offspring, who also had a desire to avenge his/her parent’s death, and then that shark’s TFHF and its TFR (Thirst For Revenge) got passed to its offspring…and so on. Anyone want to do a Punnet square for this? The problem with Punnett calculations is that we need to have some pretty detailed knowledge of the genetic setup of the species in question. Are we sure that blood thirst is only governed by one gene? And if so, is it unrelated to the gene(s) for revenge? If they’re in any way linked, the whole analysis would fail. My head hurts. Can we just ask Bill Nye? They totally should. Like, Jaws…so, is it possible for a Great White shark to get obsessed with eating people, and then get blown up, but then come back, and get blown up again, and then come back in the Caribbean? Or is the first shark’s particular taste for human flesh a genetic thing that’s passed on to future generations? Hang on, how many times did it get blown up? Most Great Whites can only get blown up three times before stopping coming back. Even in the Caribbean. Yes, it’s more wishful thinking on my part. I think we will be the longest-lasting megafauna for quite some time. Whilst it may be a slight snow storm to you northern types, your former home was recently gripped in SNOW TERROR …. in April. Odd? Apparently it happens ever 20 years or so, everything runs in cycles, right? The TT course was unrecognisable. Cronk-y-voddy was 11 foot snow drifts, inside of which a police van was “discovered”. Significant livestock loss, too. Wow, that’s some serious snowfall. How did they lose a police van in the snow? So you’re feeling the grip of the Fimbulwinter too? Do you still have snow, or has it cleared? Think the police van was just parked. The snow came down fast over a few hours one afternoon-evening, then stayed steady for the night. With strong winds we also got some drifting. Snow’s pretty much gone now, though there were still white edges on the fields around Foxdale last week.